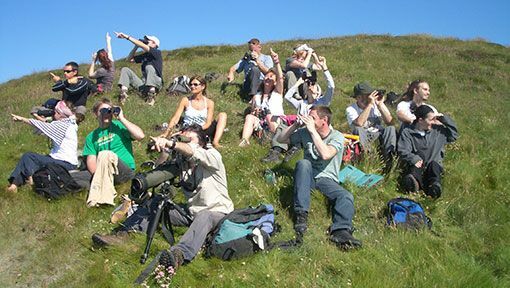 In true “lastminute.com” style, the IWDG is offering Ireland’s Wildlife readers a special one-off discount of €10 off the normal €90 course fee for this weekend’s Summer Whale Watching Course on Cape Clear Island off the West Cork coast. Hey… that’s MORE THAN 10% OFF! The course offers a fantastic opportunity to learn more about the whales, dolphins and porpoise around Ireland’s coastline, and, crucially, how to find, observe, record and identify them for yourself. Cape Clear is one of Ireland’s most striking islands… with stunning scenery and amazing wildlife both on and off-shore. Spending a couple of nights on Cape is a unique experience in and of itself — but paired with the IWDG’s whale watching course it’s truly unforgettable. I went along on one of these courses last May and had a fantastic time with a great group of people. I’d highly recommend them to anybody with an interest in wildlife. The course, run by IWDG Sightings Co-ordinator Pádraig Whooley, takes place this coming weekend (Fri 31/05 to Sun 02/06) and caters for all levels of interest ranging from beginners to those who’d like to learn more about whales and dolphins in Irish waters and how to find, observe, record and identify them. It requires all participants spend 2 nights (Fri & Sat) on Cape Clear Island. Signs are promising for the weekend. The weather looks settled, with suitable conditions for shore based and boat based sightings. There has also been plenty of activity over the last week or so, with common dolphins, basking sharks and minke whales all reported in the area. For more information, and to book your place, email padraig.whooley@iwdg.ie — and don’t forget to mention that Ireland’s Wildlife sent you to get your MORE THAN 10% OFF.